M: Justin just told me I have control problems because I nabbed the computer from him about .5 seconds after it opened to this window because I had a good idea for a title. I do have control issues. Sorry, babe. J: Yes. Now that we’ve gotten that out of the way (and more importantly, publicly documented) let’s move on to the actual post. M: First of all, to our huge, huge, massive group of readers, we are sorry we have fallen off of the face of the planet for the past 2.75 months. Rwanda got so monotonous after day 14 that we didn’t want to bore ourselves or you with more posts. There are only so many sentences/pictures you can write about rice & beans and rice & chips for dinner. M: (and I grabbed it away from him again. His head is on the table.) I just want to say YAAAAAAAAAAAAAAAAAAAAAAAAAAAAAAAAAAAAAAAAAY YOU FINISHED! I’M SO PROUD OF YOU!!!! okay here’s the laptop. M: Justin has been really good about encouraging me to be positive through it all. However, I am merely being objective when I say our experience in Rwanda was really sucky. It wasn’t awful and I didn’t hate it. It could have been WAY worse. But it was hard. We were bored, lonely, and depressed a lot. We fought more than we ever have before. I am very thankful that we have been blessed with, gifted this honeymoon afterwards. It is making it that much sweeter to be making our way through Europe now! J: We also got to hang out with old friends (Deke and Jocelyn) and also make new one’s from a study abroad group called GoEd. It was really refreshing and much needed to have them to spend time with during our last few weeks in Rwanda. Regardless, I’m super excited that we’re on our honeymoon now. It’s pretty incredible how different this week is going to be compared to our last week in Rwanda. M: Agreed. The difference is remarkable. I feel funny being here. So relieved and thankful and wanting to cry. I feel it in my bones! Also, I want a whole new wardrobe. So the great Western consumerism complex is back! Definitely wasn’t this bad in Rwanda. Justin! Get off of my Facebook on the iPad and come respond. J: Okay, so here are some pictures from our past day and a half. M: Justin was here in 2008. Apparently, if you toss a coin over your shoulder into the Trevi Fountain, it means you’ll be back. And now he’s back but with me! So it’s better. J: Although, to be honest, I’m pretty sure I never tossed a coin over my shoulder into the fountain. I’m too cheap. Same as this time. No way am I gonna toss a coin into that fountain…unless it’s a Rwanda coin. Things are useless to me now. M: How about if it’s an American penny? I have some of those in one of my 918732o498 bags I brought. 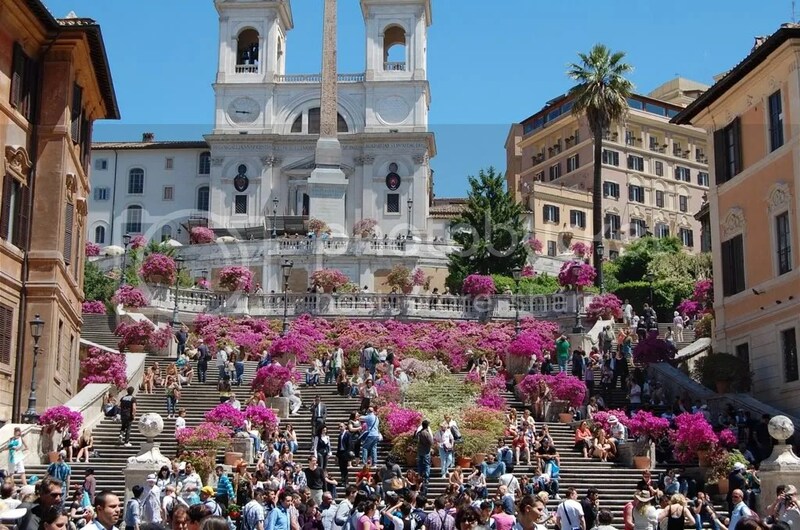 M: The Spanish Steps! Our method of exploration so far has been to just wander. It’s amazing. Except for the massive groups of tourists. We saw a big Asian group today all wearing matching red LEATHER jackets. J: The weather is much nicer this time, especially compared to Rwanda! It’s quite beautiful here….the problem is that it’s soo damn crowded now. Last time I was here during winter and it was almost entirely empty…now the place is crawling. I think there is a tourist epidemic here. M: It is the Eternal City, weenie. There are always tourists here! We agreed if we ever go anywhere else touristy in the world someday (after we get jobs and pay off all of our debts), we will go on the off-season. Even if we have to bundle up like J had to back in Winter 2008 when he was here. J: Here’s the first church we went into this morning…we won’t be posting pictures of all of the churches that we go into. There are simply too many. But here’s one, they’re super pretty. 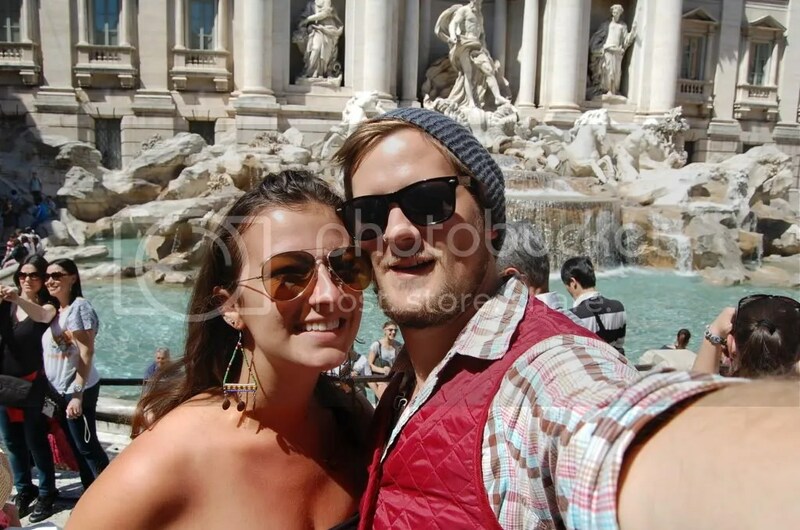 M: I got kicked out of one today above the Spanish Steps because I’m wearing a strapless dress. You also have to give an offering to take a holy picture or light a candle. Both of these things annoy me. I am all for respecting the Roman Catholic church– any place of worship, really– but I don’t know what to think about this. I had to put on a kimono when I went into a Mosque in Delhi. I don’t think Jesus would ask me to cover up or give him a drachma for anything. So I almost yelled such things at the nice guard who chastised me in French. But instead, I left. And I’ll be carrying a scarf with me to cover up with from now on. I’ll figure out my issues with the church and it’s business later. J: I did not get kicked out. The guy simply smiled at me because I’m so stylish. M: You do actually fit in really well here. Lots of skinny jeans. J: I don’t have skinny jeans on! My jeans are hideous. M: For being worn every day for 3 months, they’re looking pretty rad. It’s the vintage destroyed look, lover. J: Whatever, the guy didn’t really smile at me. 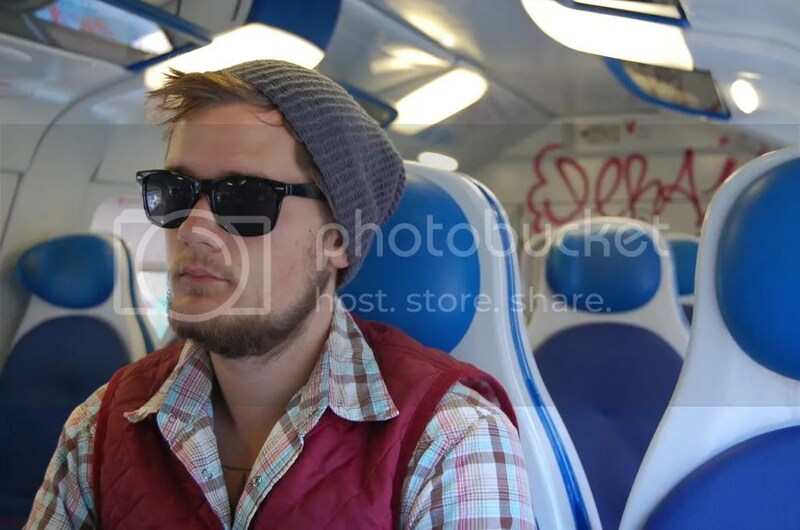 I’m not that stylish (you can be the judge, there’s one of me below on a train). M: Justin has long arms which makes it really easy to take great MySpace pictures. But seriously, folks. I am so impressed he took 2 good ones of us today. I am too scared to ask someone to take our picture because I don’t want gypsies to steal our camera. Isn’t that open-minded of me? J: I’m not scared of that. I just don’t like being around all of these people, so I snap pictures and then walk somewhere I can lean against a wall. Therefore, there are pictures of Maggs by herself but only two of us together. Don’t worry, we’ll get someone to take our picture at a few different places before we leave for the next leg of our adventure/honeymoon. 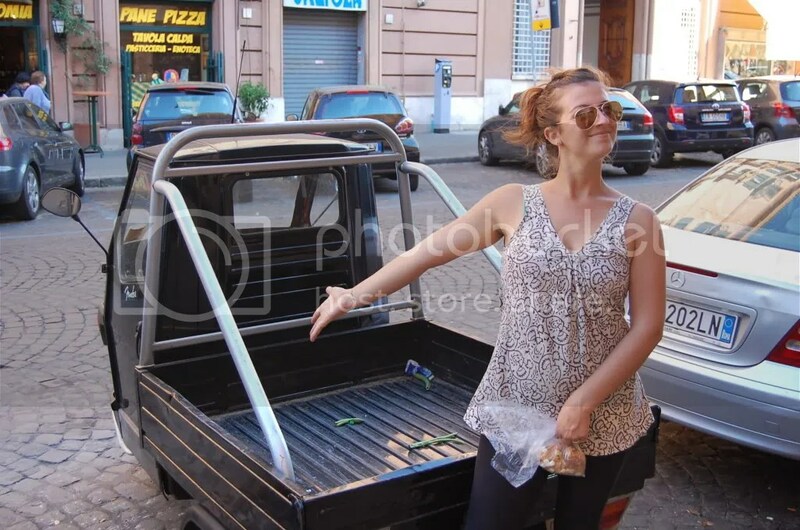 M: As long as it’s not a gypsy. M: Haters gonna hate. 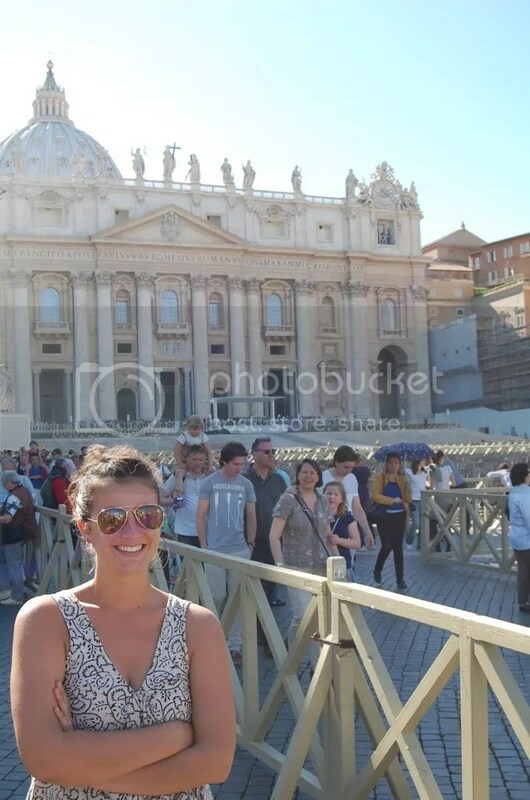 Anywho, this is from our first day in Vatican City. We got picked up in the airport in a black Mercedes because we fancy, dropped our stuff off at the room, and we went into the city. We had no idea where we were going. We just went! And we didn’t get our tickets validated (whoops!) so we rode in and out of the city for free! Another honeymoon miracle!! The first was that we made all of our flights on time AND all our luggage got here with us. Woohoo! J: Although, I sort of wish we would have lost some luggage, simply because then we’d have less to carry. But then again, I prefer carrying a lot of crap and a happy Maggie than any other scenario that includes Maggs turning into a crazy. Happy wife, happy life. M: If we lost luggage, we’d also get financial compensation. For a whole new wardrobe at Zara!!!! 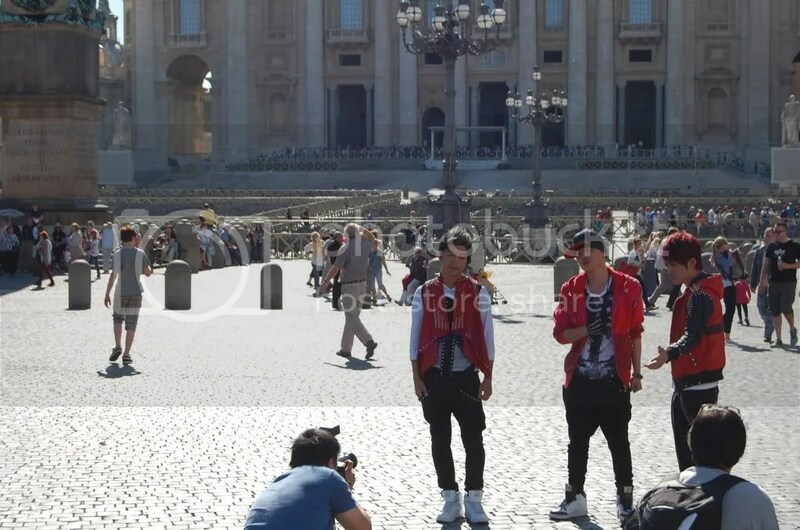 J: Saw these fellas posing in front of the Vatican. Not sure who they are or what they’re doing. Don’t care. This is priceless. M: I’m pretty sure it was for some sort of dance-off show. This is like the city of irony– so many holy places and so many… well, never mind. I guess they’re all holy people in God’s eyes. AUGH! I’m thinking about too many things too much. 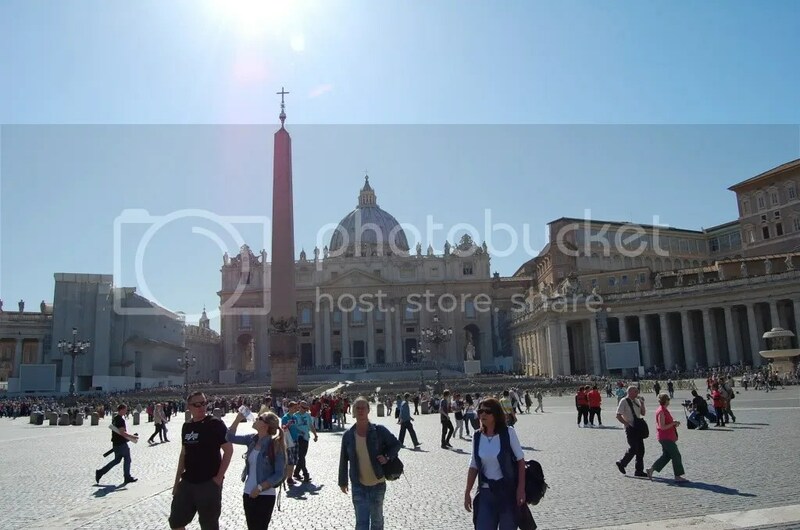 J: Here’s another shot from Vatican City–the only international boundary that can be crossed without a passport–and if you look closely, our little dance troupe has regrouped in the right side of the picture! 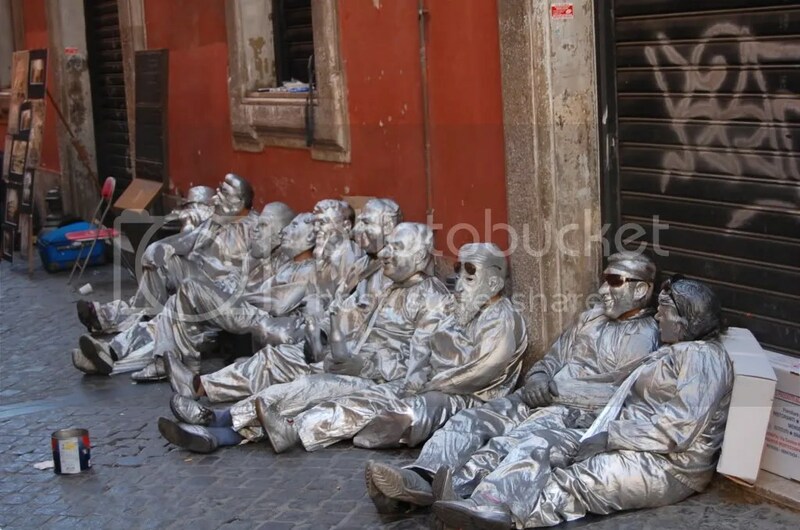 M: We have tickets to go into the Vatican Museum on the 9th. I am very excited! J: There are vehicles here that make Smart Cars look typical. This is sort of one of those vehicles. It looks like a shopping cart. M: In my hands is a bag of dried fruit from this sweet stand near a castle along the Tiber. There was guava, cantaloupe, and passion fruit in there, among others. Justin got a mix-and-match bag of candy from the same place. 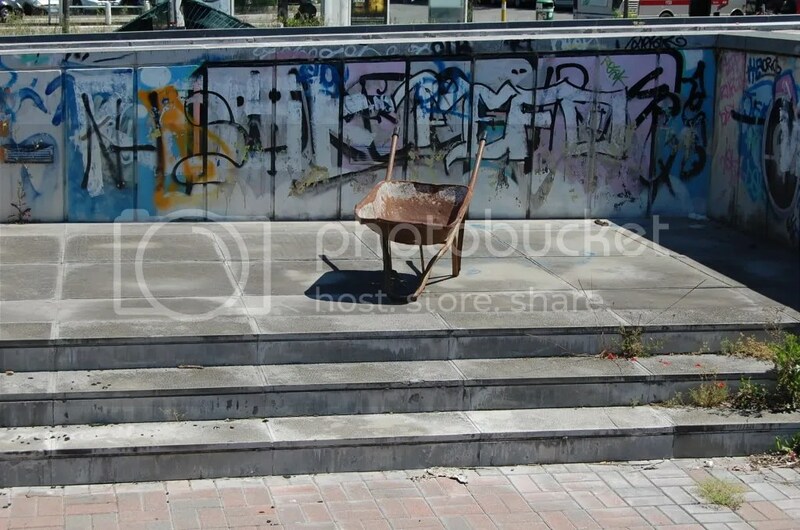 J: This is a wheel barrow and graffiti on a wall. M: Justin has such a GREAT eye for these things. I know I’ve said that before. But it amazes me every time. I told him this today and he said “I just look!” I was struck by the profound simplicity of that statement. It’s true. He just looks! J: In addition to taking pictures of random crap, I also have the luxury of traveling with my own personal model. Ain’t she pretty? M: Oh, you! I love being on a honeymoon with you!!!! 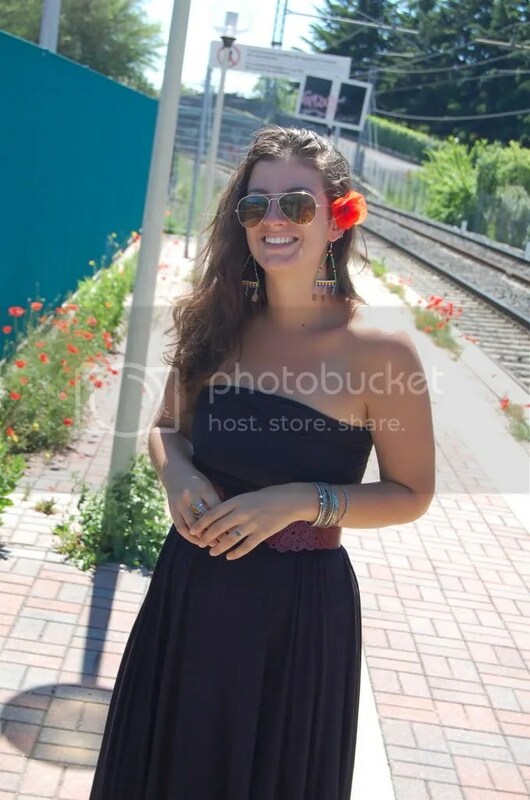 Funny stories about those poppies in my hair: I was looking at the train tracks where two poppy plants had sprouted. I was also looking at the signs that said “Do not cross the tracks” and considering darting out to grab some flowers while no trains were coming. Then I looked over at my paparazzi husband and did a double-take at all the poppy plants behind him (that you can see in the picture). So I picked some of those instead. Thus, I was saved from an untimely death. 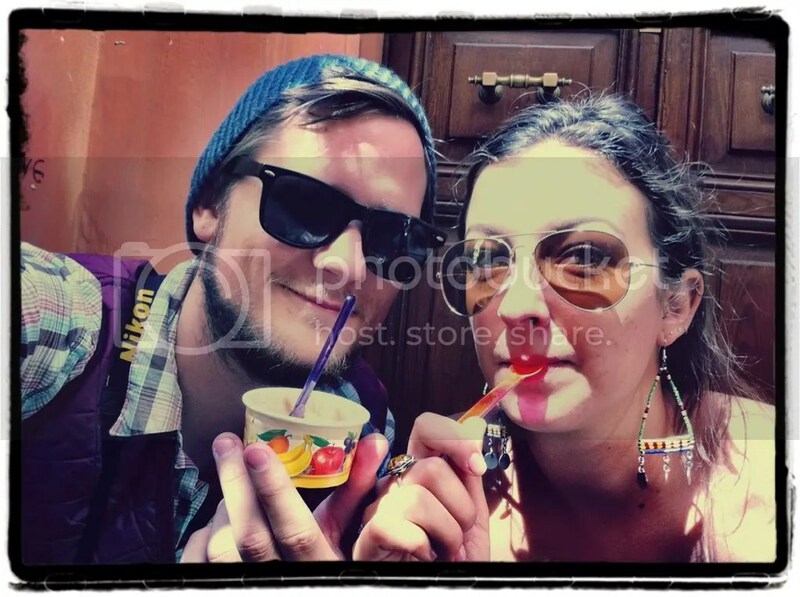 J: There is graffiti everywhere here…plus, look at Maggie’s earrings, they are nice. M: I took this one! I am so proud. Okay wait, it’s a little fuzzy. Crap. Anyway, this handsome stranger sat next to me. So I took him home to my bungalow tonight. J: It’s not fuzzy! You big dork…it can only focus at one thing at a time. You just happened to focus on me. M: In keeping with the rule of my life that my only good photos happen by accident. I don’t know how that happens. M: Here Banksy he was. Get it? 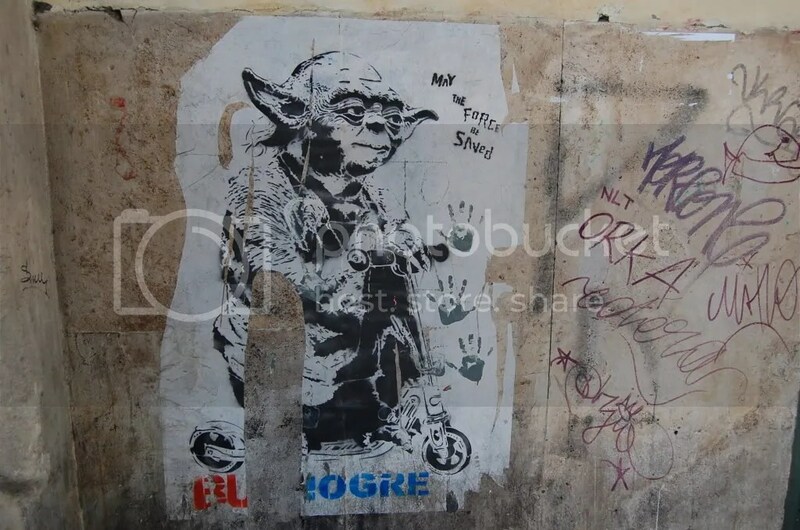 That’s how Yoda would say it. 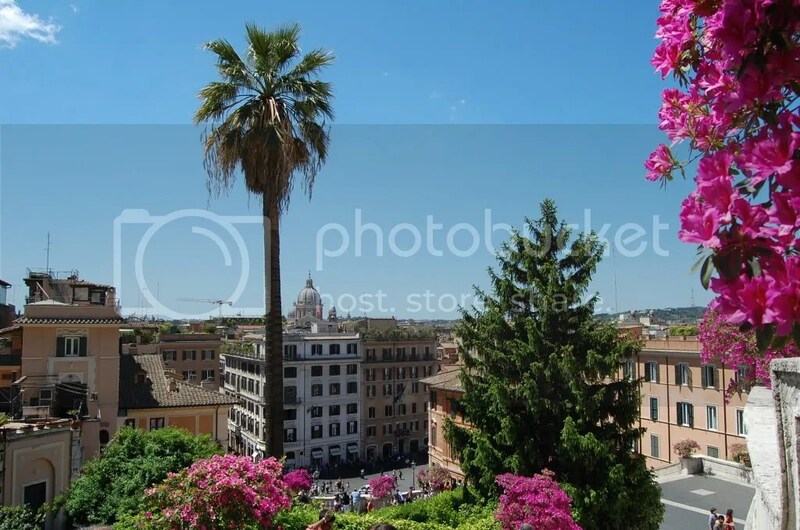 J: This one is taken from the top of the Spanish Steps…outside of the church that Maggs got tossed out of. It’s super cool to see all of the domes and whatnot from up here. It’s a great perspective. M: Because I am a floozy (said in Nacho voice). You can see so very far– and it’s the same view millions of people have seen for hundreds of years. That’s amazing. 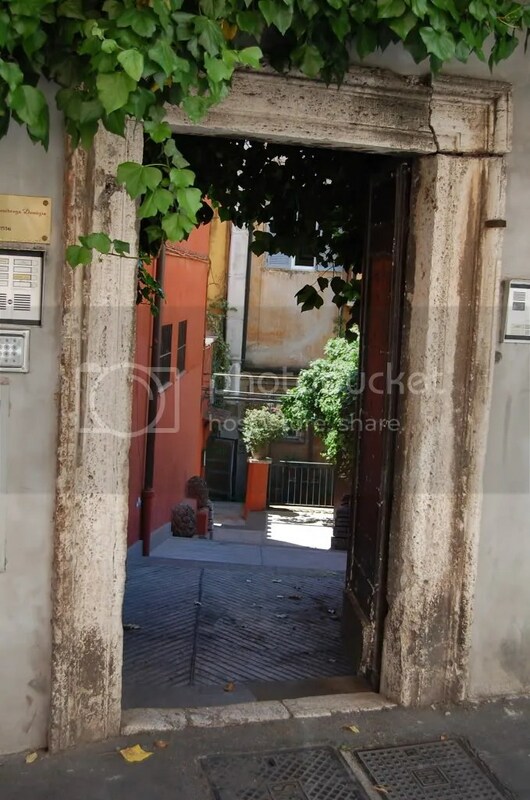 J: I really liked this doorway and the steps down behind it. I wish I could’ve explored back in there. Although I feel like that scenario would have involved La Polizia in the end. M: There are street performers everywhere. So far, I’ve seen a Michael Jackson impersonator, a blue Statue of Liberty, a man dressed all in black with a gun, and these guys. When someone tossed them money, they all raised their bottles/glasses and sort of cheered in a creepy way. J: Oh, I thought they were laughing…kind of like Santa or a crowd at a movie…either way, what a way to generate revenue right? J: It pays to have long arms. Not literally…it’s just a figure of speech for that means it’s beneficial. 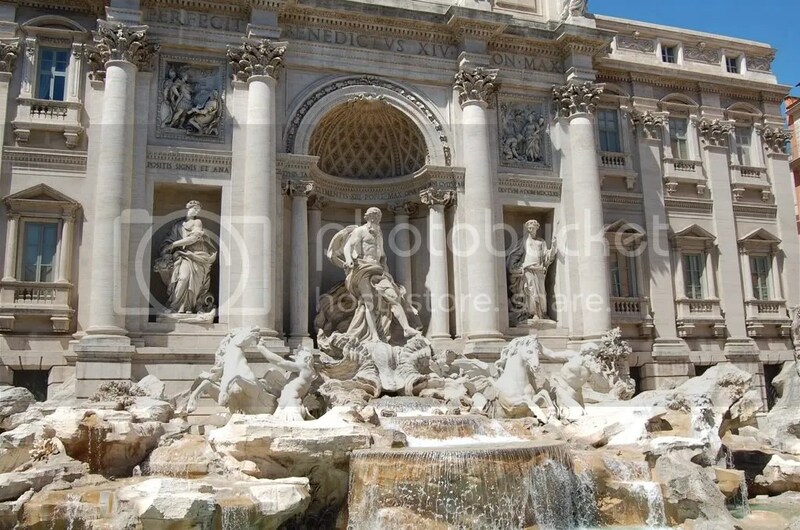 Anyways, the Trevi Fountain is my favorite. M: Your creeper pictures are my favorite. 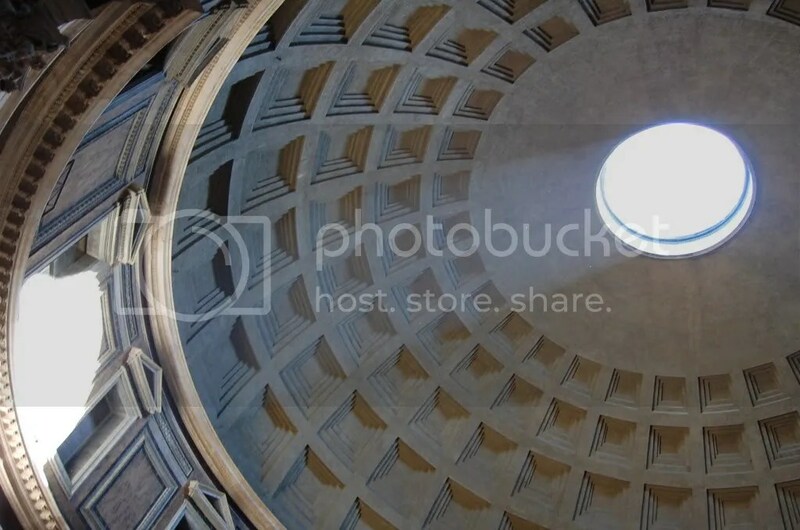 M: The Pantheon has a hole in the roof that keeps the dome from caving in on itself. Without the hole, the whole building would collapse. 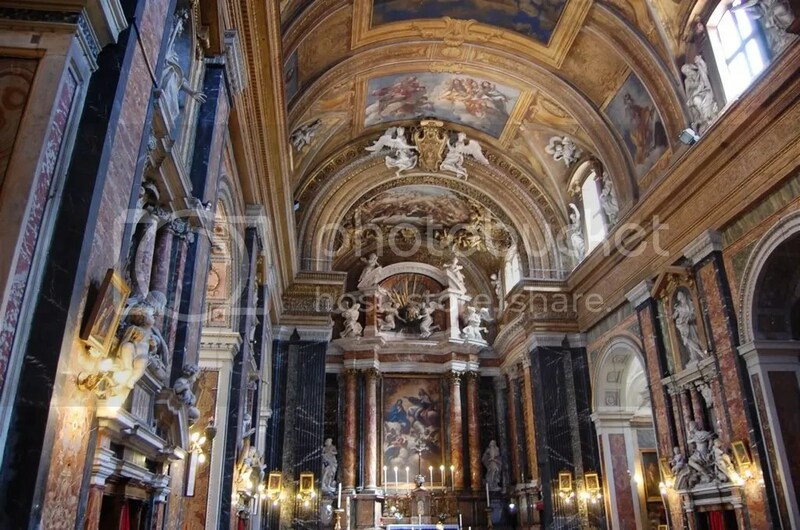 J: In case you didn’t know, the building in the picture is the aforementioned Pantheon. It was built about 2000 years ago. One upgrade/change is that the plaza that the Pantheon opens into no longer has a McDonald’s across from it. I read an email my Dad sent me back in 2008 before I came here and he had mentioned how weird/crazy it is that there’s such an ancient building and some stupid restaurant chain in the same plaza. No more Daddy-o, the Mickey D’s is no more…at least not at is particular place. 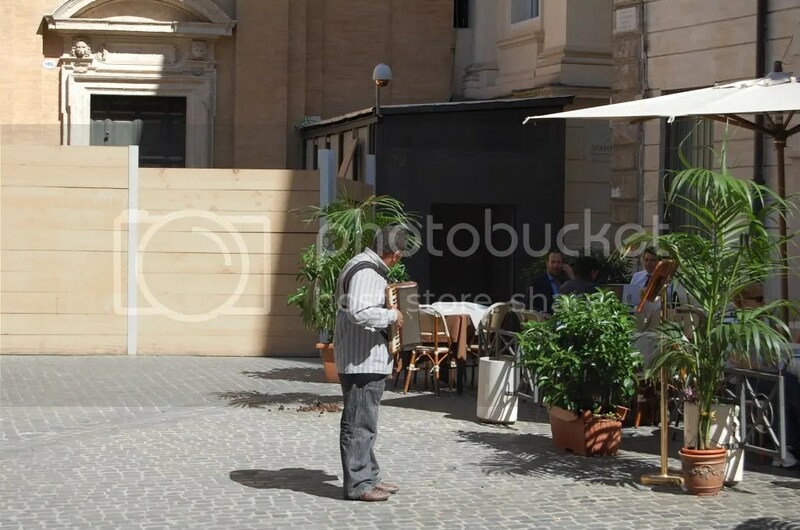 M: What there IS, however, is this killer cafe right around the corner from the Pantheon. Kate, I don’t know if this is the place you recommended, but the cappuccinos were killer. We stood up at the bar and knocked them back like good Italians would. 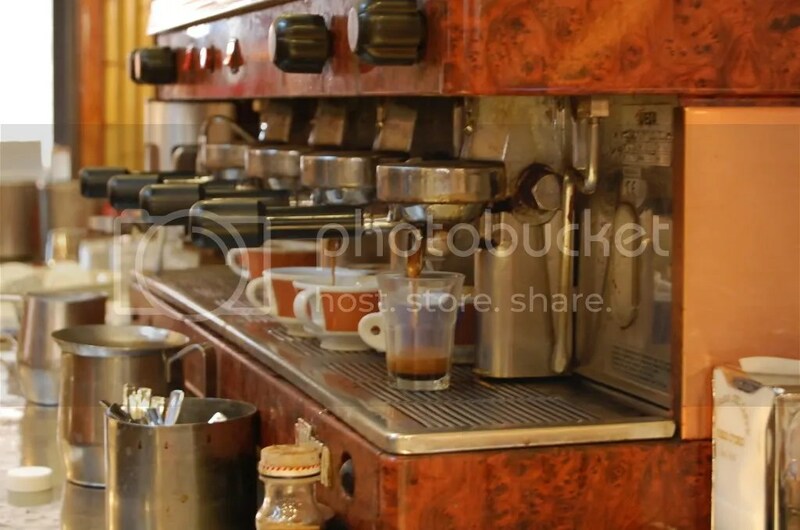 J: This is the espresso bar. It was delicious. Well worth the euro. M: My great-grandfather was a traveling accordion player from Italy– he was born just a few hours from Roma, actually. This man reminded me of him! J: He was playing a nice little song. Sorry this picture isn’t better, I didn’t want to have to pay him. M: Oh, Zara. How have I never been inside one of you before? 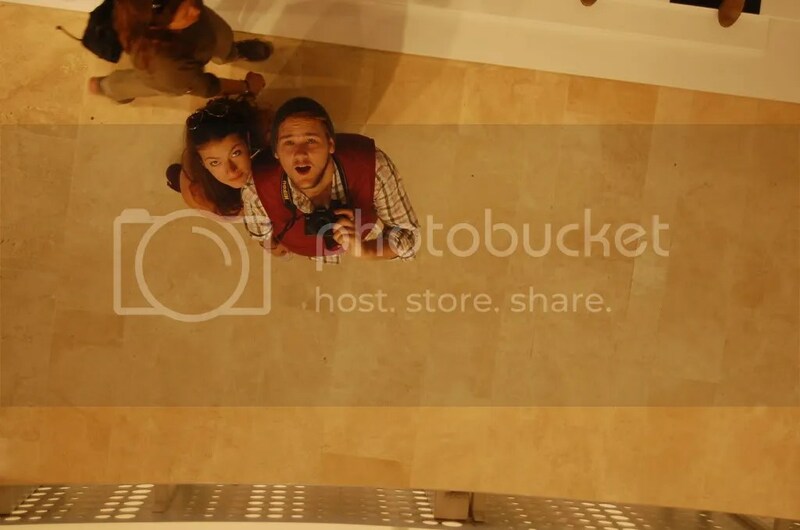 You have this sweet mirror on your ceiling that my husband can take a picture of us in. And beautiful shoes I can buy. Thereby blowing my entire treasures-for-Rome budget. And having to starve myself to use that money for more things. Priorities, priorities. J: This picture was fun to take because I noticed the mirror on the ceiling before Maggs did. I had the camera out and ready and then simply said “Look up” and then snapped this picture. Zara is nice. But I won’t be buying shoes and surely won’t be spending any of per diem for food on clothes. I imagine that the only takeaway I’ll have from this place is this picture…which I’m fine with. M: And a happy wife. Which we’ve already established is a good thing. M: I’m sorry I took your turn, but can we please go to dinner now? J: Oh yes, I’ve been thinking about it this entire time. Okay, you heard the lady folks, that’s all we’ve got tonight. Only one trick. M: Tomorrow’s trick will include getting two large backpacks, one small backpack, one large duffel bag, one handmade purse, and two huge weekender bags made out of African fabric into Rome on public transportation. Ta-daaaaa!